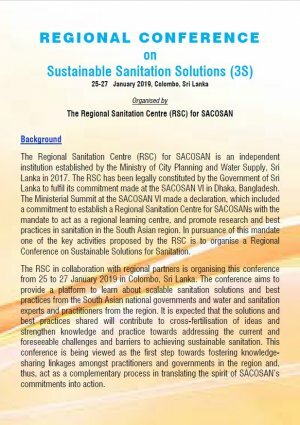 The conference aims to provide a platform to learn about scalable sanitation solutions and best practices from the South Asian national governments and water and sanitation experts and practitioners from the region. This conference is being viewed as the first step towards fostering knowledge-sharing linkages amongst practitioners and governments in the region and, thus, act as a complementary process in translating the spirit of SACOSAN’s commitments into action. Deadline for presentation applications is November 30th 2018.